Lacrosse players Leah Brennan, Jennifer DeSimone, Lexi Perez and Samantha Breeze (left to right). Goodbyes can be bitter, and for AU lacrosse players Lexi Perez, Jennifer DeSimone, Leah Brennan and Samantha Breeze, the spring semester will be their last representing the Eagles on the athletic field. For their first three years with the AU lacrosse program, wins have been hard to come by for Perez, DeSimone, Brennan and Breeze. The team has finished below 0.500 and won five games or fewer each year since 2013. However, the team is home to 15 freshmen and sophomores this season. Before they graduate, Perez, DeSimone, Brennan and Breeze are trying to change the culture for the lacrosse team by mentoring younger players. Through their four years on the team, they’ve built relationships and made connections both on the field and in the locker room. They’ve had sleepovers, dinners, TV nights and endless hours spent studying at the Bender library. As seniors, there is a collective pressure to perform during their last competitive season, Brennan said. The pressure to succeed, the seniors said, is a good kind of pressure, one that pushes them to challenge themselves to meet the team’s expectations and drives them towards their ultimate goal of winning. “The best part about playing lacrosse for American is the irreplaceable teammates and friendships that I’ve developed through this team, and knowing that these friendships will last me beyond graduation,” Perez, one of the 2018 team captains, said. Perez, DeSimone and Brennan came to AU as freshmen together four years ago. Breeze, a junior, is graduating early this May, wrapping up three years on the team. She was injured last semester and will play her final season for AU this year. Perez, a defender and midfielder, has seen her role with the team increase incrementally, playing in more games and recording more points each successive season. In 2018, Perez has taken a greater offensive role on the team, scoring 16 goals and earning two overall assists. “We’ve been grateful to have senior leaders as freshmen, that showed us the ropes in terms of how to make time, structure our days, and team accountability in general to help us stay on track,” Perez said. Brennan did not see the field during both her sophomore and junior years. She returned to the lineup her senior season, scoring 15 goals as of 2018 and starting every game. DeSimone led the team in scoring and tallied seven hat tricks as a junior. However, DeSimone has not played a single minute in 2018 after suffering a season-ending injury before the spring. Breeze, too, played in every game as a freshman and sophomore before being sidelined for her final season of competition by a knee injury. Wallace, who is in her sixth year at AU, witnessed Perez, DeSimone, Brennan and Breeze’s tentative early moments as freshmen and is overseeing their final collegiate season of competition. Wallace said she has loved coaching the group of seniors and will continue to stay active in their development off the field once they move on from AU. The lacrosse team seniors have all had to adopt leadership roles this semester with their underclassmen. The 15 freshmen and sophomores present a challenge to assimilate everyone into the team. However, nothing has changed, Perez said. She has seen her development with the team as gradual, with mentoring the younger players inherent to her role as team captain. Leadership can take the form of building team values and leading by example, as it does for Perez, or bringing a light-hearted attitude and friendly demeanor to the younger players, as it does for Brennan. Brennan said she tries to make as many meaningful relationships as she can with the younger players because she believes that taking extra steps toward building camaraderie off the field is important. DeSimone has adopted a maternal role with her teammates, said Fiona Geier, a junior goalkeeper for the team. DeSimone, who will attend nursing school in North Carolina after graduation, said she stresses to the younger players that everyone on the field is equal. As an injured senior, her role is off the field, where she builds meaningful relationships with the younger girls and brings everyone together, she said. DeSimone is an influence off the field by supporting her team members and keeping everyone’s heads held up and high, Wallace said. For Wallace, each senior offers a different element to the team. “Lexi has the loudest voice, Jen keeps things positive but she also has the wisdom and the knowledge, Leah sets the tone on a daily basis and Sam has a calming presence,” Wallace said. Perez, DeSimone, Brennan and Breeze attribute their comfort as leaders to the upperclassmen who helped them acclimate to college when they were freshmen and sophomores. The four said they hope to instill the lessons they learned, in terms of time management and team accountability, in the future leaders of the lacrosse team. The influence of Perez, DeSimone, Brennan and Breeze has helped many players, including Geier, take on more leadership and mentorship of the freshmen and sophomores. Geier views herself as the “quarterback of the defense” and cherishes the camaraderie of the lacrosse team, facilitated by many the upperclassmen on the team. As their playing careers at AU wind down — the team will play its last regular season game on April 28 — Perez, DeSimone, Brennan and Breeze said they will focus on enjoying every moment on the field with their teammates, working hard and staying focused. “We are just trying to enjoy every moment and working hard both on and off the field,” Perez said. 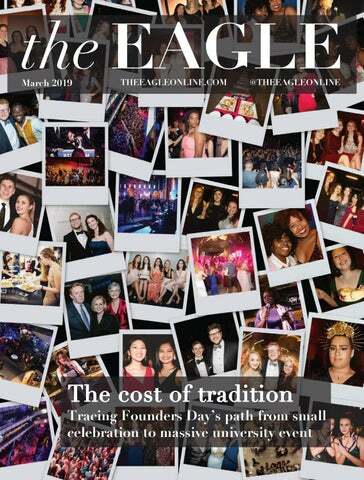 This story was originally published in the April print edition of The Eagle.